Lilya Kas'yanova, one of Kyrgyzstan's finest guides, is passionate about the history, art and craft of her country. She regularly contributes articles to this website. A graduate in Linguistics and Intercultural Communications from I. Arabaev Kyrgyz State University, she is also a keen photographer and hiker. 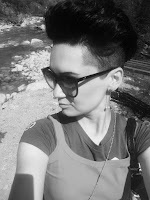 In this article Lilya takes us to the ancient settlement of Uzgen, in the south. Compared to Uzbekistan, Kyrgyzstan has few architectural monuments - its extraordinary peaks and valleys are natural, spectacular monuments. However, Uzgen settlement, situated in the Osh region of southern Kyrgyzstan, boasts a splendid architectural complex. The town sprang up on the trade route from Kashgar to Samarkand at the beginning of the Christian era. From the 7th century A.D. up to the beginning of the 16th century, Uzgen experienced exponential growth. When the maritime routes overtook Silk Road land trade, impacting economic and diplomatic cooperation in Central Asia and China, Uzgen slumped. In the 8th - 9th centuries, the settlement had been fully walled. Archaeological and topographical data reveal the town covered an area of 20-30 hectares, large by the standards of those distant times. The Uzgen settlement was positioned on the high bank of the Kara-Darya river. It was divided into several areas: the citadel (central, fortified stronghold), three shahrestans (residential quarters of the rulers and nobles), and the rabad (suburb represented by workshops, shops etc, the centre of economic life). The whole settlement was enclosed by abundant orchards and fields secured by “puddle clay” walls from east and west. Uzgen became the capital of the Karakhanid empire in the 12th century A.D.
Later, the town fell into ruins, and now mainly hills and earthworks remain. However, in the grounds of one of the shahrestans, a minaret and three mausoleums - one-of-a-kind architectural monuments of medieval Central Asia - survived the test of time. These historical and architectural landmarks are considered to be classic man-made creations of the Karakhanid era ( end of the 10th – beginning of the 13th centuries A.D.). The monumental elements of the architectural complex are conventionally known as Northern (1152 – date of substantial completion), Middle (beginning of the 11th century) and Southern (1187). Prominent figures of the Karakhanid era are buried in the mausoleums. Each mausoleum’s architectural style is different, reflecting the date of its construction. 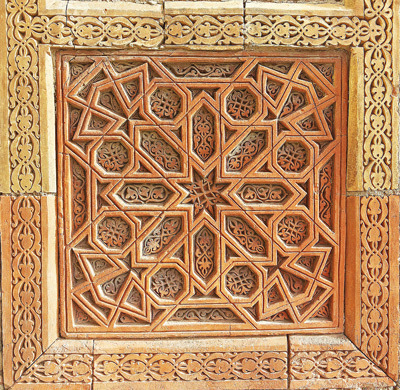 The structures abound in floral and geometric motives, elegant engraved Arabic inscriptions, delicate fretwork and terracotta tiles. Thus the complex reflects the step-by-step refinement of Central Asian architectural style and concepts. The detached minaret, built from burnt bricks bound by clay and gypsum mortar, consists of three sections: octagonal foundation, middle section – a tapering cylinder adorned with ornately shaped bands, and the upper part - crowned by a lantern (with arched windows), which was reconstructed in 1923-24. An earthquake destroyed the original upper part of the minaret in the 17th century. According to archaeologists, the minaret was originally 47 – 50 metres. Today it stands at 27.5 meters. 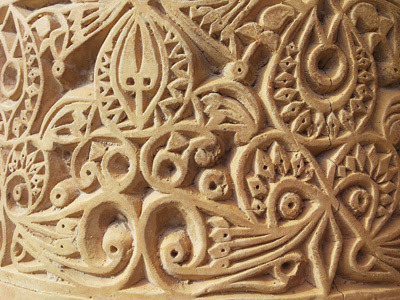 It is dated to the middle of the 11th century A.D.
A cathedral mosque, with its nearby madrassah, adjoined the minaret. Unfortunately, the cathedral mosque did not survive. Uzgen minaret, which was constructed almost one hundred years later than its northern brother Burana, shows more exquisite technique and delicate décor: its body is finely embellished by brick masonry belts in combination with embossed ganch, a mixture of gypsum and clay. The minaret was used for azan, the Muslim call to ritual prayer made by a muezzin. 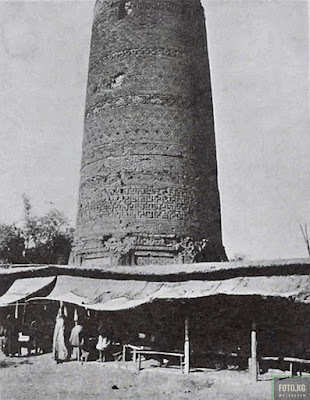 (As an aside - Jarkurgan minaret, in Termez, Uzbekistan, was also built in the early 12th century by the Karakhanids). The Uzgen architectural complex is considered to be one of the finest examples of Central Asian dome and portal architecture of the Muslim Renaissance. Soviet experts restored the complex in the 1920s and again in 1976 - 1983. In the near future, it may be listed as a UNESCO World Heritage Site. Its structures frequently adorn Kyrgyz banners and stamps and appear on the Kyrgyz 50 som note. A visit to Uzgen is not included in Uzbek Journeys tours to Kyrgyzstan. However, a trip there can be arranged either before or after your tour.